Schlock Treatment: 9th June 2007: "They Came From The Philippines" double! 9th June 2007: "They Came From The Philippines" double! The Sixties saw a revival of the gothic horror tradition thanks to Hammer’s Dracula series starring Christopher Lee, and a smorgasbord of Continental shockers like Black Sunday and The Horrible Dr Hitchcock. The last place you’d expect gothic to thrive is the Philippines, and least of all by one of their most respected filmmakers. 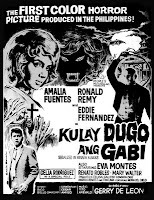 But it did, and in 1964 director Gerardo (or Gerry) de Leon released a vampire film that is both universal AND intensely and uniquely Filipino, The Blood Drinkers. Ronald Remy is striking as the complicated villain Dr Marco, as bald as Nosferatu in dark glasses and snappy 60s black outfits, and simultaneously terrorizing a secluded jungle village while pining for his dying vampire love Katrina. As well as a vampire, he’s a man of science and medicine, and with the help of his hunchbacked assistant and mute dwarf, he plans to transplant the still-beating heart of the village girl Charito into Katrina (both played by the gorgeous 60s Filipino starlet Amalia Fuentes). Modern technology and traditional faith are constantly juxtaposed in a film which cuts between colour film and black and white footage tinted in cool blues and blood red. Apparently colour stock in the Philippines in the 60s was too expensive for an entire feature, but like the rest of The Blood Drinkers, director de Leon uses this budgetary constraint to full advantage. De Leon may fill the screen with Hollywood-inspired images of caped counts and rubber bats, but this taps into a rich vein of Filipino folklore littered with tales of evil aswangs and female vampires with giant bat wings called the mananaangaal. Add almost five hundred years of Catholicism, a Spanish colonial heritage and a countryside ruled by an almost feudal aristocracy, and the image of Charito’s undead parents trying to feed off her blood becomes so much more potent, as does the overload of garish religious imagery. Both The Blood Drinkers and de Leon’s 1966 follow-up Curse Of The Vampires were sold to the world by US company Hemisphere, the company who spent most of the 60s in the Philippines jungle making war films for the insatiable American drive-in market. De Leon and Hemisphere would later craft the most notorious Filipino horror films of all, the “Blood Island” trilogy, and we’re screening the first, the 1968 Brides Of Blood, after the break. But first, settle back for a very unique Filipino vampire film, the 1964 minor horror masterpiece The Blood Drinkers. The lure of the Philippines throughout the 60s and 70s was intoxicating for low-budget filmmakers - you could produce an exotic potboiler with genuine tropical locales for a fraction of the cost in America. With Hemisphere’s successful rerelease of the 1959 Terror Is A Man - Eddie Romero and Gerry de Leon’s reworking of Island Of Dr Moreau - as “Blood Creature”, producer Kane Lynn wanted more “Blood”, and so instructed Romero and de Leon to co-direct an even sleazier jungle shocker. And so begins Brides Of Blood. On a steamboat are Peace Corps volunteer Jim Farrell (former matinee idol John Ashley), the radiation expert Dr Henderson (Kent Taylor) and his frustrated wife Carla (played by a former stripper with the unlikely but appropriate name Beverly Hills), a top-heavy B beauty with a shroud of hairspray around her polyethylene hair mountain and who manages to walk through a jungle without soiling her white shoes. They land on Blood Island, a so-called tropical paradise literally crawling with mutant plants and with a native burial seemingly every 10 minutes. The group take refuge in the mansion of the elusive Estaban Powers, an ageless patriarch whose bald, disfigured and bug-ugly manservant Goro whips his small army of semi-naked dwarves (again with the dwarves!). Dr Henderson notices alarming levels of radioactivity in the island’s maneating plants; the trail of green radioactive slime leads from the mansion through fog-shrouded jungles to a giant grotesque stone idol where virginal village girls are sacrificed to a lecherous (not to mention ludicrous) monster on the prowl. Ever the lover boy, super-suave Ashley tries desperately to save a native girl from her fateful honeymoon as one of the “brides” of Blood Island. Female patrons in its numerous drive-in runs were offered plastic wedding rings so they would be promised to the monster. Cheesy, yes, and old-fashioned even for 1968, but so successful was its exploitation hyperbole that Ashley, Romero and de Leon returned the following year with Mad Doctor Of Blood Island - not strictly a sequel, but a repeat of the formula with more flesh on display, a less laughable mutant creature on the prowl, and more green and red ooze in equal measures. 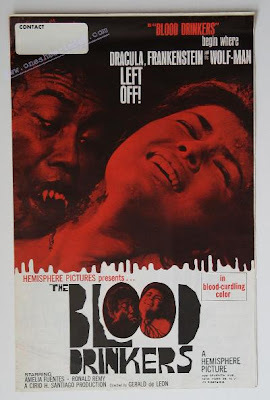 Then came Beast Of Blood in 1970, completing the so-called “Blood Island trilogy” and setting the benchmark for the crimson-streaked wave of made-in-Philippines exploitation films to follow. 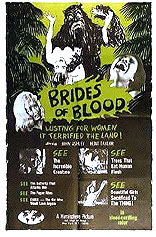 But first, the original Blood Island classic, a glowingly intoxicating cocktail of slime, grime and slice of lime - the 1968 Brides Of Blood.